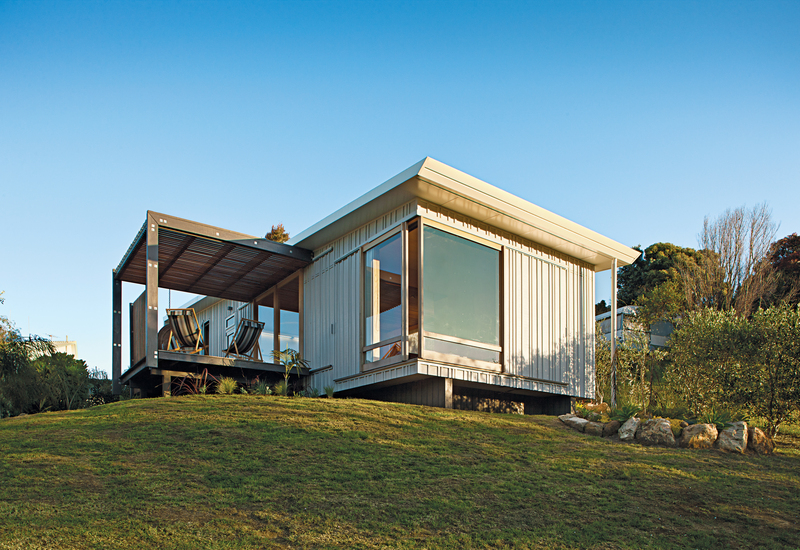 Cabins are modest by nature, a design quality that makes them conducive to prefabrication. Here are eight prefabs that tread lightly on the great outdoors. On a budget of $112 per square foot, architecture students at Auckland's Unitec Institute of Technology helped design a compact prefab for a couple who thought they'd never be able to afford a home at their favorite vacation spot. With an inconscpicuous 376-square-foot imprint on the landscape, the modular Woody35 cabin quietly bucks the trend toward larger vacation homes in Northern Europe. Prefab construction simplified the building process of this remote Wisconsin summer home, where all materials needed to be ferried across Lake Superior. The Mini House 2.0 from Swedish architect Jonas Wagell occupies a mere 160 square feet and takes as little as two days to assemble. Inspired by the construction of modular steel barns, David McAdam was convinced he could use a similar framing system to build a beautiful vacation home. The result was the Blue Sky prototype, a sustainable desert getaway that McAdam and his partner call "the Prius of prefabs." The Wedge, a low maintenance prefab cabin dreamt up by architecture students at California State Polytechnic University, Pomona, will soon be a feature of the revamped camping experience at California State Parks. The Island House, a glass cabin that sits on a petite man-made island near Amsterdam, contains a fold-out wall that allows lake access from the living room. To minimize damage to its majestic Washington site, and honor the design philosophy of his mentor Louis Kahn, architect Anthony Pellecchia had much of his vacation home Villa Lucy fabricated off-site. Photo by Simon Devitt. Image courtesy of Simon Devitt .